What Do Fevers Mean in Babies? 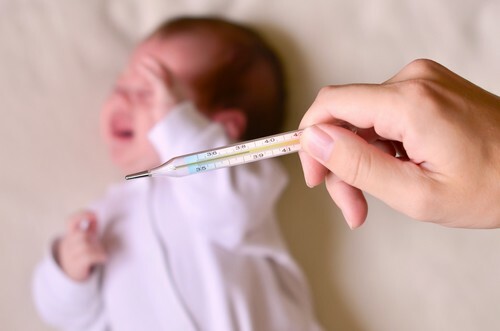 A fever is usually one of the first signs that your little one’s immune system is under siege; the exact cause can range from the uncomfortable but fairly innocuous, to, more rarely, something that requires medical intervention. Here are the top four reasons your baby might have a fever. “A fever is part of the body’s defence system against infection – to heat the body up in an attempt to kill off whatever bacteria or virus is causing the infection”, Dr Kaye explains. In other words, fever has an important role, so unless your little one is in pain, or struggling to sleep because of feeling too hot, it’s not necessary to treat the fever. Common colds can often be accompanied by fever, and while this is typical, if your child is under 3 months with a fever of 38C, or 3-6 months with a fever of 39C, you must see your doctor immediately. And if the fever continues for more than five days, or if your baby is refusing feeds, seek medical advice. A miserable baby tugging on her ear, or sporting a sudden inflamed ear, is likely suffering from an ear infection. Fever is another possible symptom. If you suspect an ear infection, or just aren’t sure what’s behind the sudden rise in the mercury, book a GP appointment. A fever coupled with spots could mean a few possible illnesses, including chicken pox, slapped cheek syndrome, roseola, or hand, foot and mouth disease. Less common are measles and rubella. “Check if the rash blanches – or fades – when a glass is pressed against it,” Dr Kaye says. “If it doesn’t call 999 as this could be a sign of a serious infection (such as meningitis) causing septicaemia. While riding out a fever, monitor your child for signs of dehydration—fewer wet nappies or dry mouth, and keep offering plenty fluids. Also remember that paracetamol (e.g. Calpol) is not to be given to babies under 2 months, and ibuprofen (e.g. Nurofen) is not suitable for babies under 3 months or 5kg, or for children with asthma. 5 Pro-Mama Tips for Pumping at WorkBrilliant Brekkie: Cheesy Veggie Egg Mini Muffins!